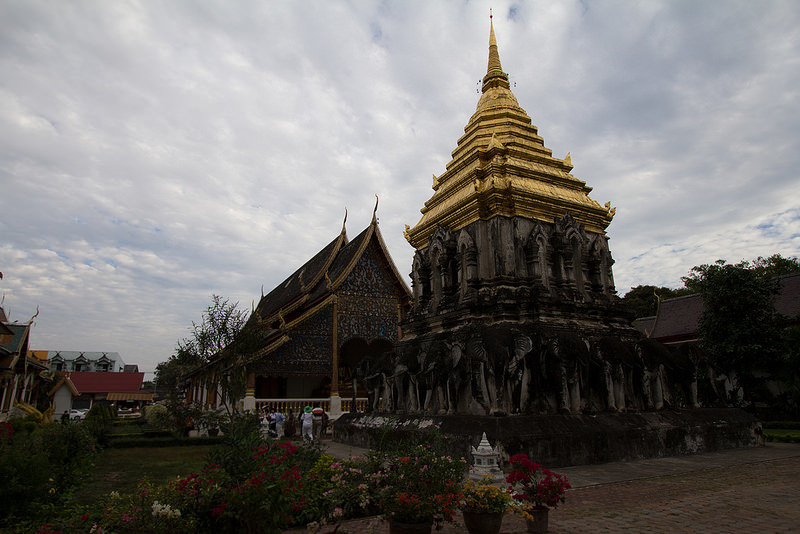 Chiang Mai is simple to get to and offers a mix of cultural and historical sites and a huge range of great things to do. Read our Chiang Mai guide for more. Chiang Mai is the largest city in Northern Thailand and accessible via road, rail and air from Bangkok, making it an easy addition to any Thailand travel itinerary. 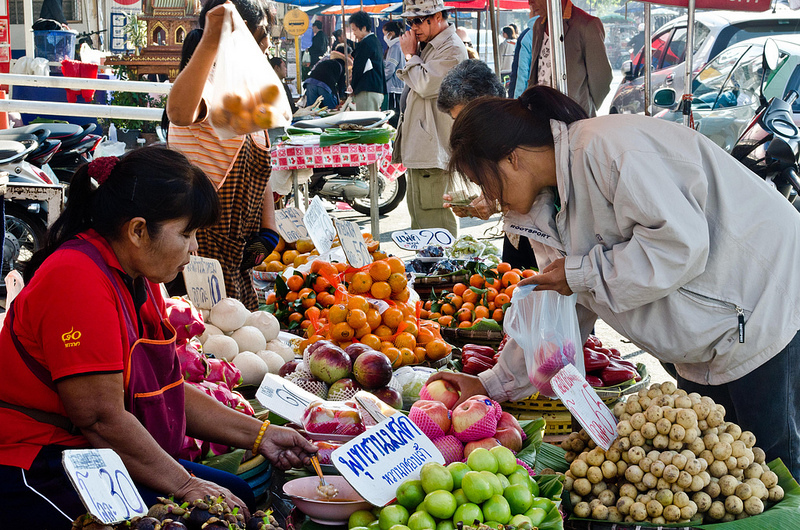 With a metropolitan population of approximately one million, Chiang Mai is North Thailand’s most populous city too. From beautiful hilltop temples to great shopping, it offers a good mix of nature and city living. Home to over 300 temples, Chiang Mai is a great place to acquaint yourself with Thai culture and history. As the hub city of Northern Thailand, Chiang Mai is also a good place to relax for a few days before departing for Pai, Chiang Rai and other nearby destinations. Note that North Thailand’s burning season lasts from February until April. During this period, the air quality in Chiang Mai can decline significantly. Chiang Mai’s Old City is home to several of its most well known temples, many of its most popular restaurants and a good selection of backpacker accommodation. Surrounded by a moat and walls, the Old City’s four gates are useful navigation landmarks in Chiang Mai. Trendy Nimmanhaemin Road is one of Chiang Mai’s most popular neighbourhoods for great food and nightlife. Located between Suthep Road and Huay Kaew Road, Nimman is one of the best places in Chiang Mai for shopping, dining and nightlife. The Chiang Mai Night Bazaar is located on the east side of the Old City. A popular attraction for tourists and locals, the area around the Night Bazaar is home to several of Chiang Mai’s most popular hotels and restaurants. Use the search box below to find out departure times and prices on your selected travel dates to Chiang Mai. Wat Phrathat Doi Suthep is an impressive Buddhist temple located atop Doi Suthep offering great views of Chiang Mai. The temple, which was originally founded in the 14th century, has expanded over the centuries to include a selection of important Thai Buddhist shrines. Built in the 15th century, Wat Chedi Luang was one of the tallest buildings in ancient Chiang Mai before suffering large-scale damage in an earthquake. The restored temple is one of the city’s most impressive historical buildings. Doi Inthanon, Thailand’s tallest mountain, is a two hour drive from Chiang Mai. The summit of the mountain features several Thai-style chedis and offers great views of the region’s rugged and mountainous scenery. Accessible via hire car or as part of a group tour. Less popular than Chiang Mai’s other Buddhist temples, Wat Pha Lat is arguably the city’s most tranquil and beautiful historical sites. Located on the hillside of Doi Suthep, Wat Pha Lat offers great views of Chiang Mai from a relaxing natural environment. Known as the “sticky waterfalls”, the Bua Thong Waterfalls are located an hour from Chiang Mai by road. The mineral content of the water and relaxed slope of the waterfalls mean you can literally walk up the waterfall from bottom to top. Chiang Mai Night Bazaar is a fun night market located east of the Old City. From clothing and accessories to restaurants and bars, the Night Bazaar is a great place to shop for souvenirs and enjoy Northern Thai food. Chiang Mai is surrounded by dense jungle, making it one of the best places in Thailand for adventuring. Explore the jungle at Dragon Flight, which has over 49 elevated platforms and a zipline above and inside Chiang Mai’s dense canopy. Chiang Mai is one of the best places in Thailand to see elephants. Elephant Nature Park is an elephant sanctuary that rescues and rehabilitates elephants in need of care. Visitors can take part in assisting elephants, buffaloes and other animals in need of help. The hills around Chiang Mai are full of great mountain biking trails. From advanced downhill rides to more relaxed cross-country trails, Chiang Mai Mountain Biking and Kayaks offers a great selection of rides with rental bikes available. Read our top seven things to do. Anantara Chiang Mai Resort and Spa offers a selection of luxurious rooms and suites with views of the Ping River. A large outdoor swimming pool and beautiful garden make this five star hotel a great place to relax in Chiang Mai. Located on 60 acres of countryside outside Chiang Mai, The Dhara Dhevi Hotel Chiang Mai is a luxurious five-star resort. Lanna-style architecture and stunning grounds make this hotel one of Chiang Mai’s most incredible accommodation options. Conveniently located between the Ping River and the Old City, the Shangri-La Hotel offers a great selection of modern rooms and suites. The hotel’s large swimming pool and gym make it a great luxury accommodation choice in Chiang Mai. The Golden Bell Hotel is a modern, comfortable three-star hotel located a short walk away from Chiang Mai’s Old City. A selection of double, twin and triple rooms with free Wi-Fi are available at reasonable prices. Villa de Chiang Mai is located close to Chiang Mai Night Bazaar, making it a great hotel for travellers that want to enjoy the Night Bazaar’s stalls and restaurants. Rooms are modern, comfortable and tastefully decorated. Located inside the Old City, Nidhra Lanna Hotel combines Lanna-style architecture with a selection of Colonial-style rooms. This four-star hotel is a convenient choice for travellers that want to be close to Chiang Mai’s best attractions. Sleep Guesthouse offers clean, simple and affordable double and twin rooms. 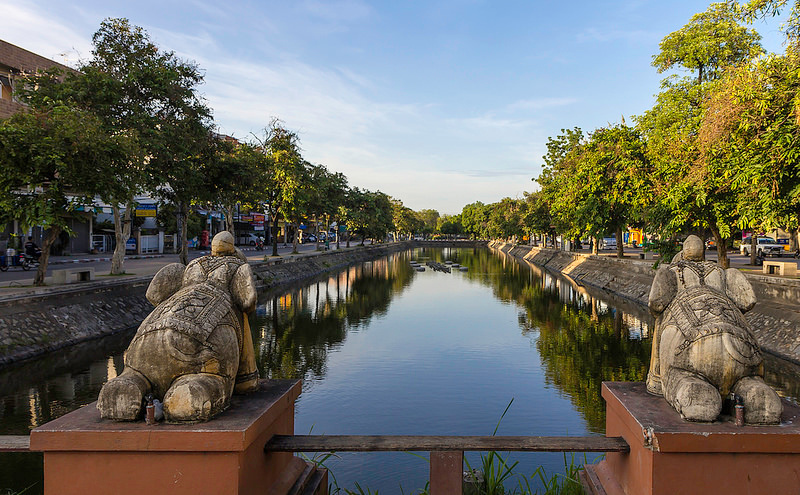 Located in the heart of the Old City, its convenient location and affordable pricing makes it a great choice for budget travellers that want to explore Chiang Mai on foot. Pyur Otel offers affordable dorms and comfortable double and twin bedrooms. With simple, clean decorating and a charming coffee shop, this hostel and guesthouse is a good choice for travellers on a budget. Located close to Chiang Mai Airport, M1 Chiang Mai is a convenient guesthouse for visitors to Chiang Mai with their own transport. The hotel is located a short distance from CentralPlaza Chiang Mai Airport, making it a good choice for guests that want to shop while in Chiang Mai. Located in the Old City close to the Sunday Market, The Rachamankha serves a great range of Thai dishes and classic desserts in a serene, relaxing environment. Ginger & Kafe is a coffee house and restaurant located on Moon Muang Road. 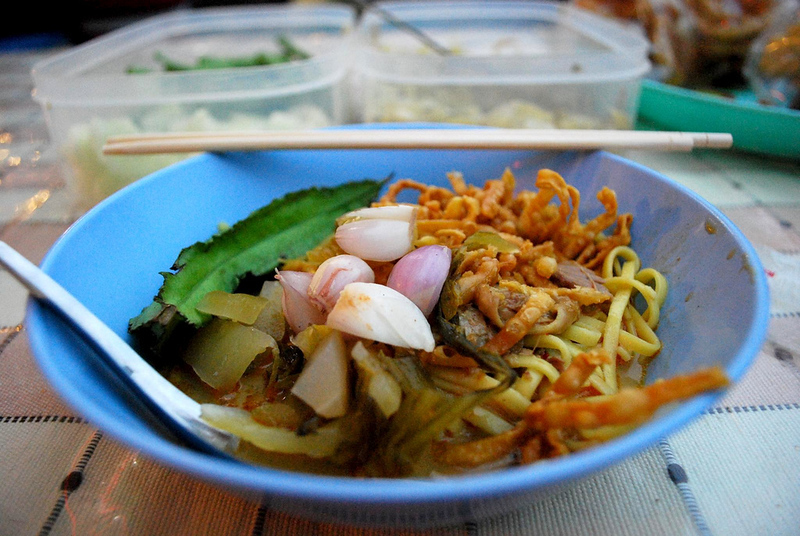 The menu is a mix of Northern Thai and Central Thai cuisine, ranging from local noodle dishes to curries and more. Beautiful gardens, flowers and a waterfall make Khaomao-Khaofang Restaurant one of the most atmospheric places to eat in Chiang Mai. The menu includes Northern Thai dishes and a great selection of international cuisine. The Riverside serves Western and Thai food with views of the Ping River. Live music and a selection of tasty Thai and Western comfort foods make The Riverside a good choice for a night out. Run by chef/owner Bebee, Bamboo bee Vegetarian Restaurant serves vegetarian dishes from all around Thailand. In addition to the vegetarian menu, a variety of tasty fruit shakes are available. Set inside a beautiful traditional Thai house, Dash! Restaurant and Bar serves a selection of well-known Thai rice, noodle and curry dishes. Tables are available inside the restaurant or in a beautiful outdoor courtyard. Chiang Mai International Airport is one of Thailand busiest airports, handling hourly flights from Bangkok and daily flights from other domestic destinations such as Phuket, Hat Yai, Krabi and Koh Samui. 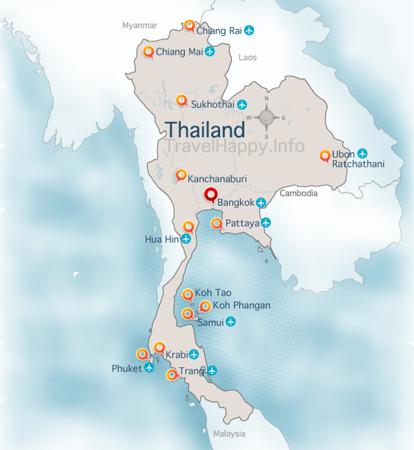 Frequent, inexpensive flights to Chiang Mai are available from Bangkok, making flying the easiest (and often cheapest) way to reach the city from elsewhere in Thailand. International flights to Chiang Mai depart from Singapore, Hong Kong, Macau and Kuala Lumpur. Check Skyscanner to compare airlines for the best prices and flight times to Chiang Mai. Chiang Mai is approximately ten hours from Bangkok by bus, although cheaper government operated buses may take slightly longer to reach the city. Public and private buses depart from Bangkok on a frequent schedule and arrive at Chiang Mai’s Arcade Bus Station. 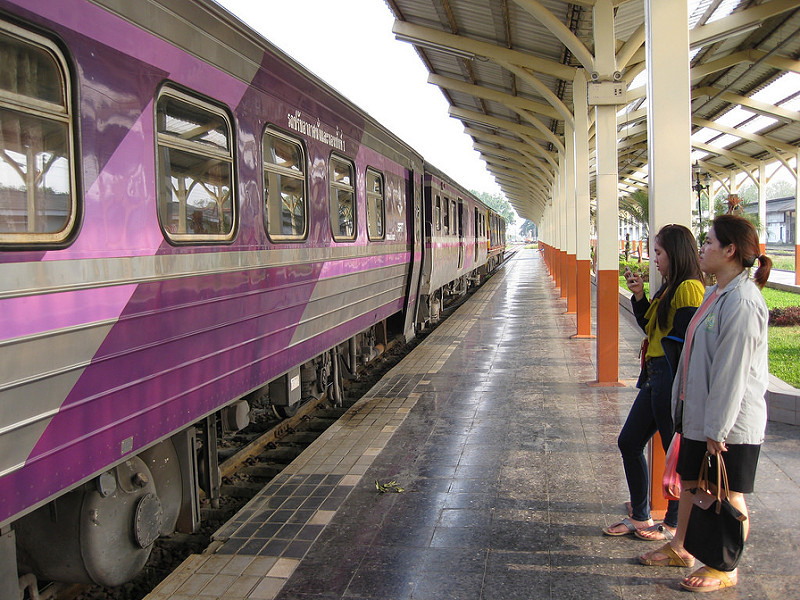 Chiang Mai is connected to Bangkok by rail, and travelling by train is a great way to see the beautiful countryside of Central and Northern Thailand. Travelling to Chiang Mai by train from Bangkok takes approximately 14 hours, making the overnight service the best choice. First, second and third class tickets are available. First class tickets offer a bed in a two-bed bedroom, while second class tickets offer a comfortable bunk in a shared car. The cheapest third class tickets only provide seating and generally aren’t a good choice for the long trip.